Save your engine! Keep your cool with a Viesa. Airconditioning without the engine running. No expensive gas leaks or compressor failures - unit uses water for cooling. Unlike other systems it allows fresh air into the cab. Remote control while lying in the bunk. Models stocked for all major truck Manufacturers: Scania, Volvo, Mercedes, DAF, MAN, Iveco etc. 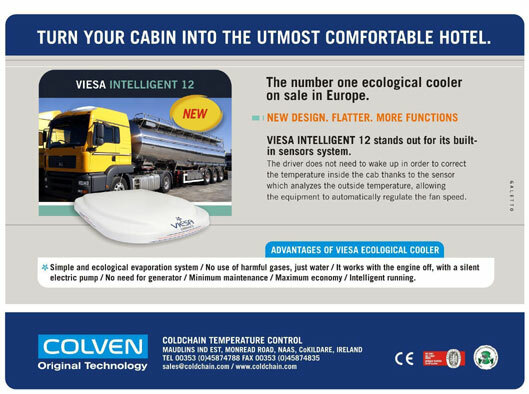 Environmently friendly - uses no refrigerant - Not affected by the proposed phase out of R134a gas. Complete technical and spare parts backup from Coldchain. Sleep well with Viesa. – Drive Safely and refreshed!